The Chronicle of Cultural Misandry: The Alarming Rate of Negative Portrayals of Men and Boys by the Media, and Their Effects. 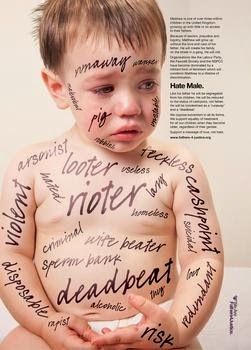 The Alarming Rate of Negative Portrayals of Men and Boys by the Media, and Their Effects. 'Women have battled for years against stereotypical and sexist portrayals in the mass media. However research shows that men are increasingly the target for negative press. The long-term effects of negative portrayals should particularly concern anyone who is raising boys, says the author of the study, Dr Jim Macnamara. Dr Macnamara found that, by volume, 69 per cent of mass media reporting and commentary on men was unfavourable, compared with just 12 per cent favourable and 19 per cent neutral or balanced. Some of the recurring themes in media content portrayed men as violent, sexually abusive, unable to be trusted with children, 'deadbeat dads', commitment phobic and in need of 're-construction'. "Men were predominantly reported or portrayed in mass media as villains, aggressors, perverts and philanderers, with more than 75 per cent of all mass media representations of men and male identity showing men in on one of these four ways," Dr Macnamara says. 'The idealised image of the metrosexual - largely a creation of the media - only further adds to the confusion being felt particularly by boys trying to find their identity in the modern world,' Dr Macnamara says. Negative stereotyping of men and male identity can contribute to significant problems in society in three key ways, Dr Macnamara warns. This makes the research not only of relevance to men, but also for women, he says. 'Ultimately such portrayals could lead to negative social and even financial costs for society in areas such as male health, rising suicide rates and family disintegration,' he warns." There we can see that this idea of the "feminine-metrosexual" man , is a media construct, which further creates a distorted view of natural masculine traits (having beards and body hair). It is a shame that here in the US, the Universities have shown no interest in making such studies to find out how men are portrayed in our media. Kind of ironic, when the feminist movement claims that we live in a patriarchal nation interested in looking out for men and boys first.